Cu/Zn-superoxide dismutase 1 (SOD1), encoded on chromosome 21, is a key enzyme in the metabolism of reactive oxygen species (ROS) and pathogenetically relevant for several disease states including Down syndrome (DS; trisomy 21). Systematically studying protein expression in human brain and animal models of DS we decided to carry out "protein hunting" for hypothetical proteins, i.e. proteins that have been predicted based upon nucleic sequences only, in a transgenic mouse model overexpressing human SOD1. We applied a proteomics approach using two-dimensional electrophoresis (2-DE) with in-gel digestion of spots followed by mass spectrometric (matrix-assisted laser desorption/ionization-time of flight) identification and quantification of hypothetical proteins using specific software. Hippocampi of wild type, hemizygous and homozygous SOD1 transgenic mice (SOD1-TGs) were analysed. We identified fourteen hypothetical proteins in mouse hippocampus. Of these, expression levels of 2610008O03Rik protein (Q9D0K2) and 4632432E04Rik protein (Q9D358) were significantly decreased (P < 0.05 and 0.001) and hypothetical protein (Q99KP6) was significantly increased (P < 0.05) in hippocampus of SOD1-TGs as compared with non-transgenic mice. The biological meaning of aberrant expression of these proteins may be impairment of metabolism, signaling and transcription machinery in SOD1-TGs brain that in turn may help to explain deterioration of these systems in DS brain. A large body of evidence proposes the involvement of reactive oxygen species (ROS), such as superoxide anion, hydrogen peroxide and hydroxyl radical in the generation of oxidative stress in a broad range of neuropathology [1–4]. Under normal physiological conditions, there is equilibrium between oxidant and antioxidant mechanisms but their imbalance results in ROS formation, leading to oxidative stress – mediated cellular damage [5, 6]. The molecular mechanisms by which altered concentrations of ROS influence cellular functions are not fully elucidated. The enzyme Cu/Zn-superoxide dismutase 1 (SOD1; E.C.1.15.1.1), which catalyses the conversion of superoxide radicals into the less toxic hydrogen peroxide (H2O2) plays an important role in the metabolism of ROS . It is a homodimer, encoded on chromosome 21 and has been suggested to be involved in the pathogenesis of neurological disease including familial amyotrophic lateral sclerosis, a degenerative disorder of motor neurons in cortex, brainstem and spinal cord  and probably in Down syndrome (DS) . A transgenic mouse overexpressing human SOD1 was created and may serve as a model for neurodegenerative disorders . It has been reported that hippocampal slices from transgenic mice overexpressing SOD1 (SOD1-TG) were found to exhibit deficient long-term potentiation, a putative neural substrate of memory, and hippocampal-mediated memory function . We decided to use a proteomic approach carring out protein profiling in hippocampus and to perform "protein hunting" using two-dimensional gel electrophoresis (2-DE) with subsequent matrix-assisted laser desorption/ionisation-time of flight (MALDI-TOF) identification of brain proteins followed by quantification using specific software, which represents a powerful tool in neurosciences [11–20]. The aim of this study was to search for the existence of hypothetical proteins (HPs), that have been identified based upon their nucleic acid sequences only and resulted in the detection of 14 HPs and significant expressional differences of HPs related to metabolism, signaling and the transcriptional machinery were observed in hippocampus of the SOD1-TG. This maybe helpful for understanding the role of SOD1 in neurodegenerative disorders. Overexpression of SOD1 was evaluated by enzymatic activity using the classic test of inhibition of nitroblue tetrazolium reduction by SOD1 and automatically assayed using a Ransod kit. The SOD1 activity was increased by factor 5 in blood. Measurements throughout the central nervous system (CNS) showed large increases in total SOD1 activity: hemizygous and homozygous SOD1-TG mice revealed an increase of 9.4 and 13.8 respectively in SOD1 specific activities as compared to WT (Unpublished data). In SOD1-TG mice, immunostaining for human SOD1 was strong in the brain and no immunostaining occurred in the CNS of WT, indicating that labeling was specific for human SOD1 . Hippocampal proteins were solubilized in the IEF-compatible reagents urea, thiourea and CHAPS and analysed by 2-D gels. The 2-DE separation was performed on broad pH range IPG strips and protein spots were visualized following staining with colloidal Coomassie blue. A series of HPs were successfully identified and a representative gel is shown in Fig. 1. 2-DE gel image of mouse hippocampus proteins depicting identified fourteen hypothetical proteins. Accession numbers are given. Brain proteins were extracted and separated on an immobilized pH 3–10 non-linear gradient strip followed by separation on a 9–16% gradient polyacrylamide gel. The gel was stained with Coomassie blue and spots were analyzed by MALDI-TOF. Proteins were identified by MALDI-TOF on the basis of peptide mass matching  following in-gel digestion with trypsin. Spots of each gel were selected randomly with the goal of detecting as many new gene products as possible ("protein hunting"). The peptide masses were matched with the theoretical peptide masses from mouse and, if not successful, of all known proteins from all species. In total about 700 spots were analysed, resulting in the identification of about 300 polypeptides that were the products of 153 different genes (Unpublished data, Shin et al., 2003). Fourteen of 153 gene products were hypothetical or poorly described gene products. Most HPs were represented by strong spots and the present study shows that they are indeed expressed in mouse hippocampus. In Table 1, data for hypothetical protein identification and assignment are provided including peptide matches, score (probability of assignment of random identity, http://www.matrixscience.com), theoretical/observed pI and molecular weight values. Similar to mitochondrial aconitase (Q99KI0) showed heterogeneity and was represented by three spots, with different pI, probably reflecting post-translational modifications (PTMs) (Fig. 1). Classification of HPs on the basis of sequence homology is based on the assumption that related proteins will have similar function. Sequence-to-function approach is the most commonly used method for functional prediction and well developed. In this study, sequence-motif approach (Pfam, Pfam protein domain database, http://www.sanger.ac.uk/Pfam/) and NCBI database was used for searching conserved domains and identity to function-known protein by sequence similarity (Conserved Domain Database, http://www.ncbi.nlm.nih.gov/BLAST) (Table 1). A HP showing one or more significant structural homologues is predicted to have molecular and functional properties similar to the homologues. Hypothetical proteins were divided into several groups by putative function (Table 1). Putative cellular localizations of hypothetical proteins were investigated by PSORT II using of k-nearest neighbor (k-NN) algorithm for assessing the probability of localizing at each candidate sites http://www.psort.org. Hypothetical proteins may be localized in cytoplasm (8 of 14, 57.1 %), mitochondria (4 of 14, 28.6 %) and nuclear (2 of 14, 14.3 %) (Table 1). 2610008O03Rik protein (Q9D0K2) was detected in 2-DE gels as one spot (Fig. 1) and expression level of 2610008O03Rik protein was significantly decreased in homozygous SOD1-TG as compared to wild types (P < 0.05). Expression of 4632432E04Rik protein (Q9D358) showed a significant decrease in both, hemizygous and homozygous SOD1-TGs (P < 0.05; P < 0.001). Hypothetical protein (Q99KP6) was detected in 2-DE gels as one spot and expression level of this protein was significantly increased in hippocampus of hemizygous and homozygous SOD1-TG (P < 0.05) (Table 2). This HP has 504 amino acid residues and its nucleic acid sequence was directly submitted to the EMBL/GenBank/DDBJ database (Strausberg R., 2001). Quantified hypothetical proteins in hippocampus of SOD1-TG and wild types. Mouse SOD1 was significantly reduced in hemizygous SOD1-TGs (P < 0.05) and even more pronounced in homozygous SOD1-TGs (P < 0.001) (Table 2). Human SOD1 presented with two spots in the gel and was undetectable in WTs. Spot 1 of human SOD was clearly represented in hemizygous SOD1-TGs and significantly higher in homozygous SOD1-TGs (P < 0.05). Spot 2 of human SOD1 and the sum of both spots were significantly higher in homozygous than in hemizygous SOD1-TGs (P < 0.05). We herein describe existence of fourteen HPs in mouse hippocampus that were predicted based upon their nucleic acid structure only (Fig. 1 and Table 1). Quantitative evaluation of expression levels revealed that expression of three HPs was deranged in hemizygous and homozygous SOD1-TGs: Expression levels of 2610008O03Rik protein (Q9D0K2) and 4632432E04Rik protein (Q9D358) were significantly decreased in SOD1-TG hippocampus while Hypothetical protein (Q99KP6) was significantly decreased (Fig. 2 and Table 2). We furthermore show that human SOD1 is clearly expressed in homozygous and hemizygous SOD1-TGs at the protein level. The partial images of hypothetical proteins representing aberrant expression in hippocampus of SOD1-TGs (arrow). In addition, spots of mouse SOD1 and human SOD1 were detected in 2-DE and only human SOD1 was expressed in transgenic mice. 2610008O03Rik protein (Q9D0K2) has two conserved domains, coenzyme A (CoA) transferases (pfam01144) (Fig. 3), and belongs to an evolutionary conserved family of enzymes catalyzing the reversible transfer of CoA from one carboxylic acid to another. Predicted function of 2610008O03Rik protein is succinyl-CoA: 3-ketoacid CoA transferase (SCOT, EC 2.8.3.5) (Table 1), a mitochondrial enzyme in mammals that is essential for the metabolism of ketone bodies. SCOT is responsible for the transfer of coenzyme A (CoA) from succinyl-CoA to acetoacetate. 3-oxoacid CoA-transferase, which catalyses the first committed step in the oxidation of ketone bodies, is uniquely regulated in developing rat brain . Changes in 3-oxoacid CoA-transferase activity in rat brain during the postnatal period are due to changes in the relative rate of synthesis of the enzyme . In addition, 2610008O03Rik protein was detected in 2-DE gel of rat brain . Although the significance of this enzyme in DS has never been studied, the findings of the derangement of intermediary metabolism-related enzymes in DS brain  and decreased expression of 2610008O03Rik protein indirectly suggest involvement of this enzyme system in brain development or metabolism mechanisms of SOD1-TG and probably DS. Graphic view of putative conserved domains of hypothetical proteins. Domains were predicted by sequence-motif approach (Pfam, Pfam protein domain database, http://www.sanger.ac.uk/Pfam/) and NCBI database (BLAST search, http://www.ncbi.nlm.nih.gov/BLAST). 4632432E04Rik protein (Q9D358) showed high similarity to low molecular weight phosphotyrosine protein phosphatase (or acid phosphatase) (LMW-PTP) acting on tyrosine phosphorylated proteins, low-MW aryl-phosphates and natural and synthetic acyl-phosphates [25, 26]. Reversible phosphorylation on tyrosine residues is a key process governing cell division, growth and differentiation. This activity is carried out by phosphotyrosyl protein phosphatases (PTPs) (EC 3.1.3.48) acting as a negative control of receptor tyrosine kinases (PTKs), which are important mediators of intracellular signalling [27–29]. The LMW-PTPs are a group of soluble PTPases displaying a reduced molecular mass. Great attention was recently focused on LMW-PTPs, a group of cytosolic non-receptor PTPs, 18-kDa enzymes widely distributed in mammalian tissues, previously known as low molecular weight acid phosphatates [30, 31]. These enzymes, although structurally unrelated with the other PTPs, display at the active site the consensus sequence CXXXXXRS/T typical of all members of the PTP superfamily . In mammalian cells, LMW-PTP is able to specifically bind and dephosphorylate activated human platelet derived growth factor BB (PDGF-BB) and insulin receptors, modulating the onset of the mitogenic process . LMW-PTP action is exerted during the G1 phase of the cell cycle and affects myc and fos gene transcription induced by PDGF-receptors activation . The enzyme also dephosphorylates EGF receptors in bovine brain suggesting that it may be involved in modulation of EGF signaling in the nerve tissue . In addition, the expression levels during neuronal phenotype induction by nerve growth factor (NGF) and during neurogenesis in chick embryos were investigated . These data indicate that the neurogenesis process is accompanied by a physiological increment of LMW-PTP expression in vitro and in vivo, using the developing chick brain as experimental models . Distribution of LMW-PTP in subcellular fractions of rat brain tissue and the abundance of LMW-PTP in nerve endings as well as in the cytosol suggest that this enzyme plays an important role in synaptic function . Despite the relevant number of data reported on the structural and catalytic features of a number of low Mr PTPases, only limited information is presently available on the substrate specificity and the true biological roles of these enzymes, in prokaryotic, yeast and eukaryotic cells. Hypothetical protein (Q99KP6) contains two conserved domains: Ubox in the N-terminal region and WD-40 repeats in the C-terminal region (Fig. 3). Ubox, a modified RING finger domain, was found in pre-mRNA splicing factor, several hypothetical proteins, and ubiquitin fusion degradation protein 2, where it may be involved in E2-dependent ubiquitination . WD-repeat proteins are characterized by weakly conserved core domain flanked by the dipeptides GH and WD . WD-repeats often form a propeller structure that seems to be an ideal platform for protein-protein interactions. Several cytoskeletal proteins contain WD repeats and this structural motif also occurs in the beta-subunit of heterotrimeric G proteins, a component of the transmembrane signaling machinery . In addition, WD-40 domain was found in a number of eukaryotic proteins that cover a wide variety of functions including adaptor/regulatory modules in signal transduction, pre-mRNA processing and cytoskeleton assembly [38, 40]. This HP was increased in SOD1-TG and its over-expression may lead or represent impaired cytoskeleton and/or mRNA splicing in hippocampus, which in turn may be in agreement with cytoskeleton and mRNA splicing deficits observed in DS brain [41, 42]. Another major finding of this study is the demonstration of human and mouse SOD1s in the same gel. This allowed the concomitant quantification of these enzymes from one and the same gel. 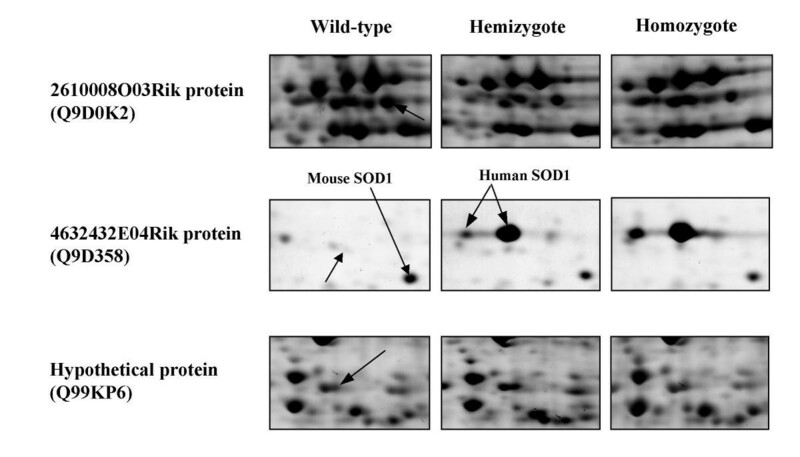 The findings of absent human SOD1 in the wild types, comparable expression in hemizygous, and significantly higher levels in homozygous SOD1-TGs biochemically and biologically characterises and defines this mouse model. Moreover, the fact that mouse SOD1 was significantly decreased in hemizygous and homozygous SOD1-TGs may indicate functionality and inclusion into the regulative system of SOD1. We herein provided a series of HPs that were predicted from nucleic sequences only, to exist and expressed in mouse hippocampus and the list of these proteins is contributing by adding new structures to cascades and pathways. In addition, an analytical tool for the characterisation of HPs in brain is given. Aberrant expression of some HPs may help to understand proteinchemical changes in the SOD1-TG hippocampus, which in turn may allow insight into pathomechanisms of mental deficits in the SOD1-TG per se but probably also in DS brain. Transgenic mice harbouring the human SOD1 gene were obtained from Dr. Jacqueline London, University of Paris, France. Generation of the human SOD1 transgenic line KT has been described previously ; it has been obtained by injecting an 11.5 kb EcoRI-BamH1 fragment containing the human SOD1 gene into fertilized eggs from FVB/N mice. Fourteen to sixteen transgene copies were inserted in tandem onto murine chromosome 15. Transgenic progeny were identified by polymerase chain reaction using DNA obtained from tail. Non-transgenic mice (wild-type) were generated with normal FVB/N mice, which were themselves initially obtained from crosses between hemizygotes. Every effort was made to minimize the number of animals used as well as to avoid any pain and discomfort. Mice were sacrificed for the experiments by decapitation and hippocampi was dissected by Rachel Weitzdoerfer, MD, Univ. Vienna, Dpt of Neonatology and Daniela Pollak, MSc, Univ. Vienna, Dpt of Basic Sciences at -20°C and kept at -80°C until biochemical assays were performed. The freezing chain was never interrupted until use. For human SOD1 activity measurements, mice brain extracts of WT and SOD1-TG mice were prepared in 100 mM Tris buffer, pH 7.5, with 0.1% (v/v) Tween 80. Activity of SOD1 was assayed photochemically by measuring inhibition of nitroblue tetrazolium reduction using a Ransod kit (Randox Laboratories) . Hippocampal tissue was suspended in 1 ml of sample buffer consisting of 40 mM Tris, 5 M urea (Merck, Darmstadt, Germany), 2 M thiourea (Sigma, St. Louis, MO, USA), 4% CHAPS (3- [(3-cholamidopropyl) dimethylammonio]-1-propane-sulfonate) (Sigma), 10 mM 1,4-dithioerythritol (Merck), and 1 mM EDTA (ethylenediaminetetraacetic acid) (Merck), a mixture of protease inhibitors, 1 mM phenylmethylsulfonyl chloride, and 1 μg of each pepstatin A, chymostatin, leupeptin, and antipain. The suspension was sonicated for approximately 30 sec and centrifuged at 150,000 g for 45 min. The protein content in the supernatant was determined by the Coomassie blue method . 2-DE was performed essentially as reported . Samples of 0.7 mg protein were applied on immobilized pH 3–10 non-linear gradient strips in sample cups at their basic and acidic ends. Focusing started at 200 V and the voltage was gradually increased to 5000 V at 3 V/min and kept constant for a further 24 h (approximately 180,000 Vh totally). The two-dimensional separation was performed on 9–16% gradient sodium dodecyl sulfate polyacrylamide gels. The gels (180 × 200 × 1.5 mm) were run at 40 mA per gel. 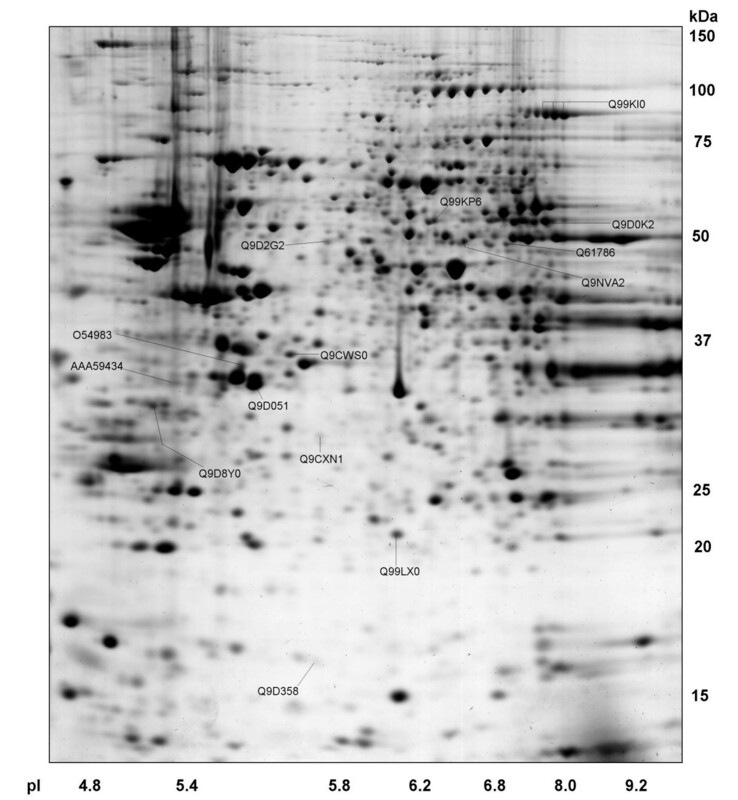 After protein fixation for 18 h in 50% methanol, containing 5% acetic acid, the gels were stained with colloidal Coomassie blue (Novex, San Diego, CA, USA) for 5 h. Molecular masses were determined by running standard protein markers (Gibco, Basel, Switzerland), covering the range 10–200 kDa. pI values were used as given by the supplier of the immobilized pH gradient strips. Excess of dye was washed out from the gels with distilled water and gels were scanned in an Agfa DUOSCAN densitometer (resolution 200). Electronic images of the gels were recorded using Photoshop (Adobe) and PowerPoint (Microsoft) software. Spots were excised with spot picker (PROTEINEER sp™, Bruker Daltonics, Germany), placed into 96-well microtiter plates and in-gel digestion and MALDI sample preparation was performed by an automated procedure (PROTEINEER dp™, Bruker Daltonics, Germany). Briefly, spots were excised and washed seven times with 10 mM ammonium bicarbonate and 50% acetonitrile in 10 mM ammonium bicarbonate in turn. After washing, the gel plugs were shrunk by addition of acetonitrile and dried by blowing out the liquid through the pierced well bottom. The dried gel pieces were reswollen with 40 ng/μl trypsin (Roche Diagnostics, Germany) in enzyme buffer (consisting of 5 mM Octyl β-D-glucopyranoside (OGP) and 10 mM ammonium bicarbonate) and incubated for 4 hrs at 30°C. Peptide extraction was performed with 10 μl of 1% TFA in 5 mM OGP and directly applied onto a target (AnchorChip™, Bruker Daltonics, Germany) that was spotted with α-cyano-4-hydroxycinnamic acid (Sigma, St. Louis, MO) matrix thinlayer. The mass spectrometer used in this work was an Ultraflex™ TOF/TOF (Bruker Daltonics, Germany) operated in the reflector mode. An accelerating voltage of 25 kV was used. Calibration of the instrument was performed externally with [M+H]+ ions of angiotensin I, angiotensin II, substance P, bombesin, and adrenocorticotropic hormones (clip 1–17 and clip 18–39). Each spectrum was produced by accumulating data from 50–200 consecutive laser shots. Spectra were interpreted with the aid of the Mascot Software (Matrix Science Ltd, UK). For protein search, a mass tolerance of 100 ppm and 2 missing cleavage sites were allowed and oxidation of methionine residues was considered. The probability score calculated by the software was used as criterion for correct identification. Protein spots were outlined (first automatically and then manually) and quantified using the ImageMaster 2D Elite software (Amersham Pharmacia Biotechnology). The percentage of the volume of the spots representing a certain protein was determined in comparison with the total proteins present in the 2-DE gel. Protein levels are expressed as means ± standard deviation of the percentage of the spot volume in each particular gel after subtraction of the background values. Between-group differences were analyzed using non-parametric Mann-Whitney U test (for comparison between two groups) and Kruskall-Wallis test (for comparison among three groups). The level of significance was set at P < 0.05. JHS improved and performed 2-DE and created the data. JWY developed protein extraction and constructed 2-DE gel. MLP and JL generated and evaluated the transgenic mice. GL initiated and planned the study developing the concept, supervised 2-DE, mass spectrometry, creating data and the manuscript. All authors have read and approved the final manuscript. We are highly indebted to the Red Bull Company, Salzburg, Austria, for generous financial support and Paly Evelyne for her expertise of genotyping the mice and Maureen B. Felizardo for excellent thechnical assistance. Work was supported by EU grant QLRT-2001-00816 and a grant from the foundation Jerome Le jeune. Marie Le pecheur is a recipient of the foundation Jerome Le jeune.